Matiullah Joyia wants to open a mosque, but for now he’s looking for followers at swap meets, Starbucks and a women’s jail. “War,” one of them said. It’s the type of reaction that compels Joyia, a missionary from the Ahmadiyya Muslim Community, to go to the jail every Sunday afternoon. He’s looking to dispel myths about Islam, and to peacefully invite people into his religion. “Anyone is welcome to stay, anyone is welcome to leave. It’s a matter of the heart,” Joyia said. Matiullah Joyia begins a meeting at the Women’s Community Correctional Center with a silent prayer. It’s also why he posts “Coffee, Cake and Islam” events on meetup.com, welcoming anyone who’s interested to sit with him at a Starbucks and discuss Islam. And it’s why he sets up a booth filled with books on Islam at the Aloha Stadium Swap Meet. When a family passing his booth at the swap meet approached him aggressively to insist, “Jesus is the only way,” Joyia said he engaged them in conversation. Still, these can be tough crowds for Joya, who’s been working in Hawaii for a year and a half to generate a tiny congregation of three families. And his efforts don’t have the support of the wider Islamic community. About 4,500 Muslims live in Hawaii, according to Hakim Ouansafi, chairman of the Muslim Association of Hawaii. But in Ouansafi’s opinion, Joyia isn’t one of them. “They’re preaching not what Islam teaches but what (Mizra) Ghulam Ahmad, the founder of Ahmadi, teaches,” Ouansafi said. Mizra Ghulam Ahmad, who Ahmadis consider to be a messiah, founded the religion in 1889 in what is now Punjab, India. Their belief that Ahmad is a prophet separates Ahmadis from other branches of Islam. The Ahmadiyya community is familiar with conflict. Its members have faced persecution and discrimination within the Islamic world for more than a century as a result of their doctrinal differences with mainstream Islamic sects. In some Muslims-majority countries, Ahmadis are considered heretics and in some cases “worse than infidels,” Joyia said. State-sponsored violence against the community, particularly in Indonesia, Bangladesh and Pakistan, has caused a mass exodus to Western countries. In 1974, Pakistan’s then-Prime Minister Zulfikar Bhutto amended the country’s constitution to declare Ahmadis to be non-Muslims. Legislation passed a decade later made it criminal for Ahmadi people to proselytize or even identify as Muslim. Joyia’s own family fled Pakistan when he was 8 in search of religious freedom in Canada. “We wanted to live in a peaceful place that offers us security,” he said. Joyia is one of about 2,000 official missionaries from the Ahmadiyya community who, following the completion of their religious education, are sent around the world. “We’ve had some Ahmadis over the years in the Hawaiian Islands but we’ve never really had a formal chapter or presence,” said Amjad Mahmood Khan, a national spokesperson for the Ahmadiyya Muslim Community in the United States. Ahmadiyya is a centralized organization with 74 chapters in the United States and an international headquarters in London. Member contributions finance the sect’s missionary work, including living expenses and a small stipend that Joyia and his family depend on for their livelihood. Joyia arrived in Honolulu with his wife and daughter a year and a half ago after working for five years in the Marshall Islands, where he opened the country’s first mosque and amassed a following of about 200 converts. With just three Oahu families registered in the religious organization’s national database, Joyia’s local congregation is still in its infancy. Imam Matiullah Joyia offers one-on-one lessons to a family at their home in Honolulu. “It’s hard to get people’s attention because everybody’s so busy making ends meet,” he said. After months of searching for a location, Joyia found a space to rent in Iwilei where he plans to open a mosque in the coming year. He hopes it will become a gathering place for Ahmadis and a hub for community service programs. For now, he visits with the families individually to offer lessons and guide prayer. At least initially, Joyia said he doesn’t get into the theological differences between Ahmadis and other mainstream Muslims when he teaches. He said he preaches Islam, not Ahmadiyya theology, and lets his students choose which doctrine they agree with. 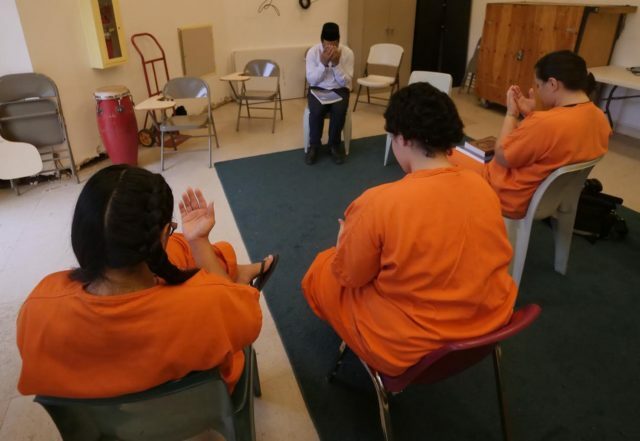 HaneefBilal Salahuddin Abdul-Shafiq, a social worker in the women’s correctional center, said Joyia has had a positive impact on the inmates he’s worked with. Last year about 40 women fasted during Ramadan: “no food, no water, no chewing gum, no nothing,” he said. “In Hawaii … there’s never been Islam in the women’s prison, but we have it now,” he said. Audio reporting by Emily Dugdale.